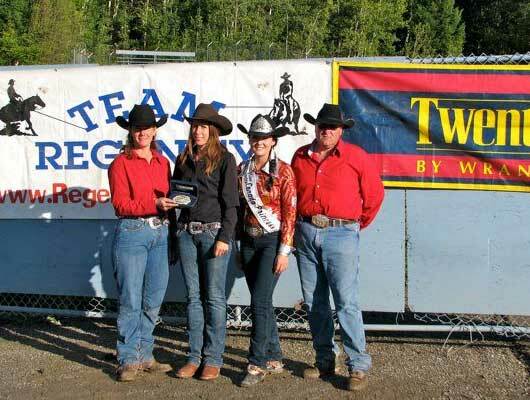 The 2011 BCRA Championship Finals Rodeo was held September 16th, 17th & 18th at Alex Fraser Park in Quesnel, BC. 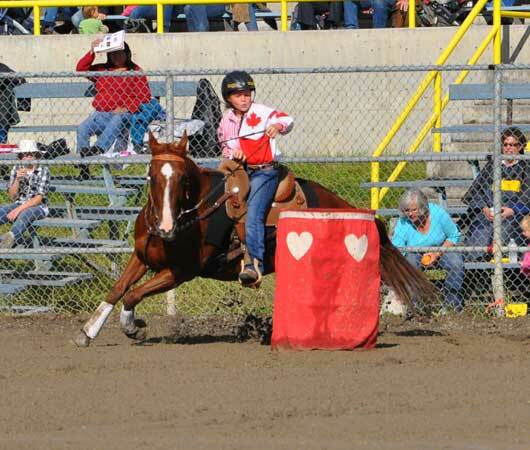 This year, all three of the 2011 BCRA Finals Barrel Racing Champions hail from the small community of Savona, BC. 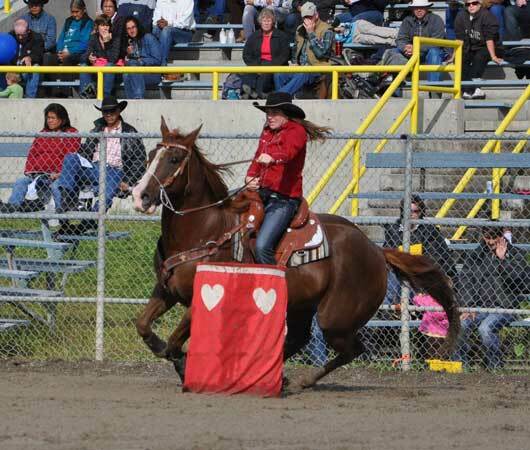 Situated on the Trans-Canada Highway 1 at the western end of Kamloops Lake about halfway between Cache Creek and Kamloops, Savona boasts of a population of 650 and is also the home town of Professional Barrel Racer, Joleen Seitz, the 2006 Calgary Stampede LBR $100,000 Winner. Sarah Gerard came into the 2011 Championship Finals number 6 in the BCRA Ladies Barrel Racing Standings. She placed 5th in the first go round, just out of the money and points, and went on to win the second and third go round and the average, garnering 120 points to lay claim to the 2011 Ladies Barrel Racing Championship, $1,625.00 and a Troy Fischer Trophy buckle. This is Gerard’s second year competing on her six-year-old mare, Mona, and the second time Mona has qualified Sarah for the BCRA Finals. Gerard purchased Mona as a two-year-old and trained her using some of the methods she learned working with the late, great Kenny Mclean, considered by many to be the greatest Canadian rodeo cowboy of all time. I noted that Mona didn’t seem to mind running in the mud on Sunday, clocking the fastest time of the day, 15.644. “I ran her at the Finals here in the mud last year and she handled it real well. I just try to stay out of her way,” said Gerard. A practice that seems to be working for her, as Sarah is no stranger to the winner’s circle. Junior Barrel Racing Champion, Tosha Seitz, was 5th out of the top six Juniors in the year end standings. Tosha started out Friday night with a fast time that would have won her the first go had it not been for a five second penalty on a downed barrel. Even so, Seitz placed fourth in that round. A third place finish in round two and a first place finish in round three put her second in the average, earning sufficient points to capture the JBR Championship, the Troy Fischer Trophy buckle and $550.00 for the weekend. 2011 is Miss Seitz’s first year competing as a Junior and she has displayed the competent horsemanship her family is known for. Riding her mom’s fifteen-year-old gelding, Guy, Tosha felt a little discouraged after knocking a barrel in the first round but didn’t let that slow her down. She enjoyed the Finals and camping on the grounds with her family for the weekend and is looking forward to attending the BCRA Awards Banquet in November. This is the first year Elly Farmer has qualified for the BCRA Finals. Miss Farmer ended the 2011 rodeo season sitting 2nd in the standings out of the top six Pee Wee Barrel Racers. After winning the first two rounds, a knocked barrel placed her 4th in the third go and 2nd in the average but still earned her 120 points to win the Pee Wee Barrel Racing Championship, the Troy Fischer Trophy buckle and $280.00 for the weekend. Elly shares a little bit of her history, some information about her horse and her first Finals experience. Thank You Melissa and Western Horse Review for supporting the BC Rodeo Association and rodeo family!